Funktion-One/DiGiCo fixtures are situated in the nightclub, which was designed by the owner, Toni Andrews. The entire senior staff all came from former clubs with Funktion-One systems. So it was unanimous that we selected Funktion One for the main dance floor. Meyer Sound and DiGiCo fixtures were selected for the Beach Club, a total immersive audio environment, with over 100 speakers; located at every cabana and private tables, including a jacuzzi. Fiberoptic’s run all through the venue for placing FOH anywhere in the venue for operation or tuning. There is audio in the corridor outside for the line to enjoy the music inside as well as in the foyer to build the excitement before entering the clubs. 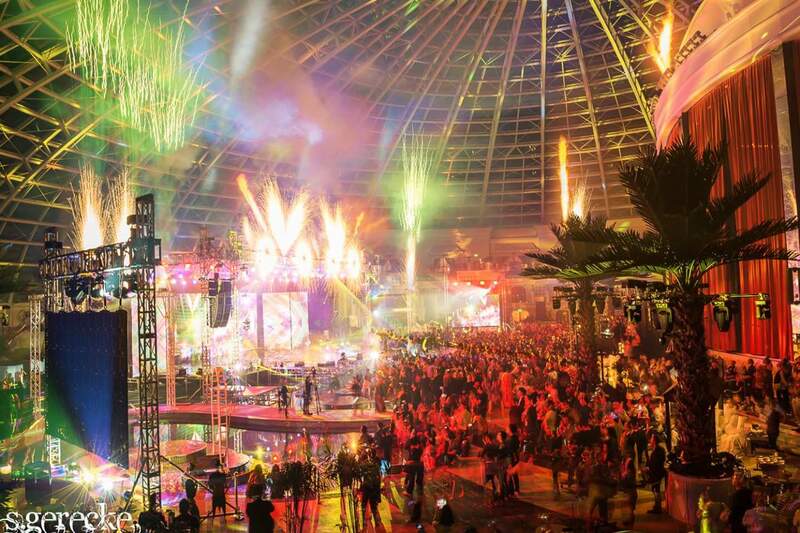 The AVL Design for the Cove Beach Club and NightClub involves over 1,000 fixtures with over 20 types of effects. The lighting design for the Beach Club was achieved by starting with the goal of having lights and effects in every location surrounding the club – to have the ability to cover any event or performance in the space. I designed all the power and signal boxes to match up with the local rental inventory so the space can be modified easily for incoming events. Robe CMY’s and Robe strobe fixtures cover the roof tops in the space with an LED engines bright enough for long throws since the space is 110 meters wide and 40 meters tall. All 14 Palm trees has, Mega Light Strobes, Robe Vivas, Kvant Lasers, Cuepix Binders and Robe Spikies. The 3-way swimming pool has 130 High Powered LED Anolis Custom Made Pool fixtures and 2 in every jacuzzi making the pool the centerpiece to the beach club. 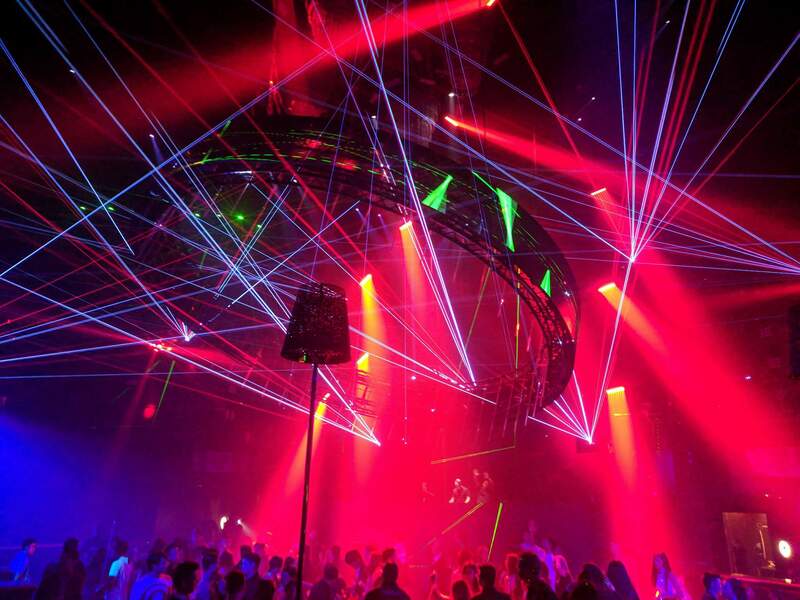 The Nightclub is quite the equipment list starting with the centerpiece a one of a kind custom 15 metre diameter Parasol Light Track System; the 12 carts and track are covered in Minleon LED Tubes run by Madrix. The Parasol Lifted by a high speed digital motor system by XLNT cyberhoist. Inside of the Parasol is a one of a kind custom designed 1.25 meter tall by 12 meter diameter video cylinder with an 88% Transparency 12mm pitch video curve with Minleon LED tubes on the inside run by Madrix. The video cylinder is also lifted by high speed cyberhoist motors. Inside the video cylinder is 4 one of a kind custom made chandeliers from Minleon LED running 80,000 channels by Madrix. On the main stage, we have 80 square meters of 4.8mm pitch video, Robe Viva 30 Robe Viva CMYs, 40 Robe Spikies, 40 Robe Strobes, 62 Robe MiniMe, 30 Elation ACL 360, 24 UV Wash, 19 Kvant CM6000 6watt Scanners, 2-25watt Kvant/PDI Laser Tables, Confetti Stadium Blaster, 16 Magix FX CO2, 6 Sony Camera System, Arkaos, Resolume, Edirol, RGB Link, ALL Control by a Grand MA2 Full Size with 9 NPU’s and 25 MA2 Nodes. The visuals are the most important element to the design as we spent 6 months developing themed content to make the environment unique to any other club. The custom, parasol, video cylinder, chandeliers, and pool fixtures, were also created so that our space would be unique to anything else in the world market. The products were chosen based on quality and output. Because no xenon sources are used anywhere we were able to build the entire AVLR system using only 600 circuits. If this was xenon it would have been more than triple that. Because the LED create little to no heat the fixtures longevity before failure increases ten fold. The brands were also selected as they are the most commonly specified brands for clubs and concerts. I have been working with most of these manufacturers as they deliver the best support along with the best products. 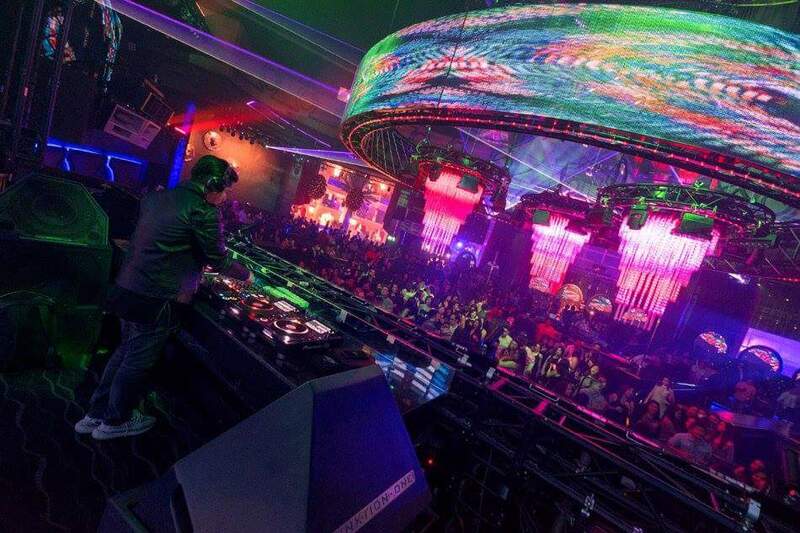 The kinetic centerpiece and the video screens with custom content give us thousands of combination looks to make the club feel totally different as the nigh goes on. For other special effects the dance floor is surrounded with sparkulars, and antari light/smoke machines, and magic FX CO2 blasters. The main challenge during installation was finding a integration company capable of installing such a highly technical design with brands they had never work with before. We found our integrator by interviewing each possible integrator and testing how they would man power and schedule the installation, then gave them Beto Kaiser our senior project manager from our side who has built some of the world largest events like the last Olympics opening and closing ceremonies Rio and Carnival Rio for 30 years. Another challenge was construction did not follow sequencing so we had to constantly try to stay ahead of them otherwise walls, ceilings and floors could get closed before our work was done. The architectural space and building cost was over 200 million US dollars to build. The Beach Club space is the 110 meter wide 40 meter high dome in the Eastern Hemisphere, which make its one of the largest club in Asia. I think the most amazing challenge to this project was that the entire Audio. Video, lighting, staging, rigging and installation cost under 8 million USD.